On October 28th we got the flu shot. On November 3rd we cut back occupational therapy to biweekly. November 18th we started taking a friend to school with us. The 21st and 22nd we had the 14yo's sleepover and that put a monkey wrench in consistency too. Extra people always makes it hard. Then there was Thanksgiving, and family, and food and school only one day that week. Physical Therapy was canceled due to the holiday and then OT got moved to Dec 8th. So... normally on Monday's when we have OT we go into Nashville up to the Bill Wilkerson Center at Vanderbilt for the occupational therapy. This week we went in to Dickson for his Physical Therapy. He wouldn't or couldn't focus on what was needed to be done. Very difficult guy. To add to it, he has quit using the potty again. He does good at school, it's just once he gets home or if we are out and about, he has alot of accidents now. Back to the picture... This week they are themed on bears. Remarkably, Benji doesn't have any stuffed bears. 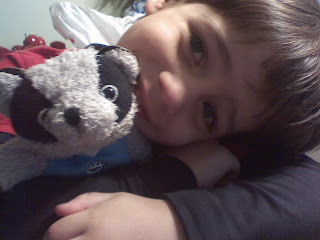 (really have no clue how that has happened) So, I explained to him that he needed to bring a stuffed toy to school and with alot of finesse on my part got him to taking Ronnie the Raccoon. This morning he was very worried that he would get in trouble for taking a toy to school. I explained the note his teacher sent and showed it to him and read it to him. Then he was afraid he would leave it. So, dropped Benji and his friend off at school this morning, explained to the teacher that he thought he was going to be in trouble and she told him that this time they needed to bring it. So.. that's why Ronnie made today's picture. Ronnie that Raccoon is a special stuffed animal that Benji got when he was in the hospital as a baby having heart surgery. Saving Little Hearts makes care packages for kids having heart surgery and Benji received one. I encourage you if you are looking for a charity to give to, to donate to them. They have monthly meetings and connect families together. Plus they do the care packages. On to the next day in our crazy life... here's to praying that the little guy gets potty trained sooner than later. And that he settles out and we have a good December.